President Paul Kagame has defended the move to turn Africa into a single trading entity devoid of restrictions. The head of state was having a one-on-one conversation with Mo Ibrahim as the last session after a full day of panel discussions focused on public services, good governance and effective leadership in Africa. But Kagame is concerned that for the free trade area to be effective in a short term, there is a need for mindset change, efficiency and how the continent conducts business. “African Free Trade Area is part of the AU reforms, which comes out of realisation of need. That 44 countries have seen the significance and some have even ratified it is encouraging. I am very optimistic about the trade agreement,” Kagame said in his submission during the conversation. He explained that the concept of turning the continent into a single trading entity, is part of the AU reforms. But Mo Ibrahim tasked president Kagame to elaborate on how independent the African Union will be while it still operates in a building built by the Chinese. He said the African Union experts have come up with a funding formula of 0.2% levy on eligible imports and almost 25 countries are already implementing and many more are willing. “The formula is predictable and has automaticity around it. Those who haven’t understood are free to engage in a conversation about it,” Kagame said in support of an ongoing transition for the AU to realise self sustenance in funding. 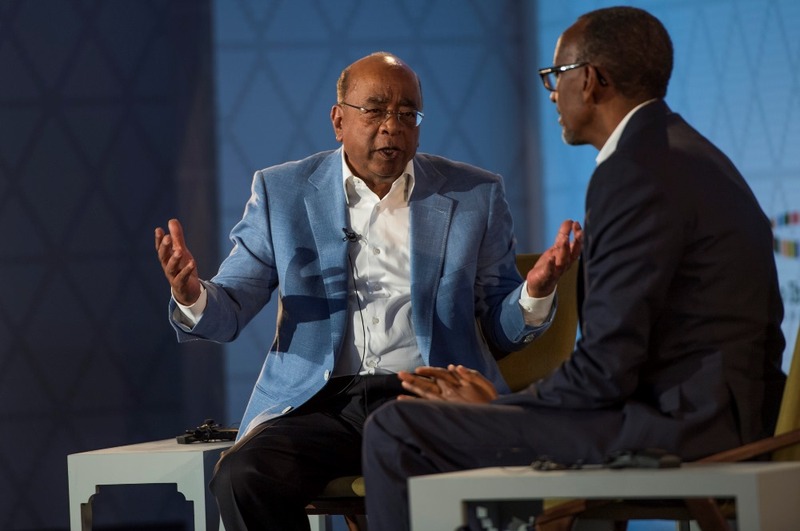 In a more than hour-long conversation, Mo Ibrahim and Kagame flipped through several topics of interest on the continent including; the International Criminal Court (ICC). For Kagame, the ICC was initially supposed to cover the whole world, but ended up covering only Africa. He argues that the Africans being tried committed the crimes with people from elsewhere. “Right from its inception, I said that the court would be trying Africans. It’s not bad to try crimes, people have to be accountable. But the concern is in the process and whether justice would be seen to be served,” Kagame noted with concern. African leaders will have to move beyond rhetoric and continuous anti-corruption slogans, but bring culprits to justice. “I happen to find slogans useful, but we need to urgently move beyond this. What we have to do is to insist on accountability and punish offenders. Corruption is not limited to Africa,” Kagame says. Rwanda is among the most corrupt free countries across the globe and has for the second year running ranked third least corrupt country in Africa. For presiding over a government that has propelled the country to one that is highly regarded for gender parity, their conversation had something to submit on this matter. “There is only so much I can do, but the conversation has already been going on here at home, and this will continue as we work together and share our experiences to ensure women get what they deserve in the African Union,” Kagame said. The much anticipated prize money awarded by the Mo Ibrahim foundation was scooped by former Liberian President Ellen Johnson Sirleaf. She’s the first woman to win the prize and says she will use it to establish a center for the empowerment of women. Ibrahim Prize committee recognised her important role in Liberia’s recovery after 12 years of civil war. “God has bequeathed me a restless spirit that always believes things can always be better for Liberia and Africa; for people in poverty and for women and girls around the world,” Sirleaf said.